Killed in action during the Battle of Jutland, aged 26 years. Thomas Elwyn Jones was born in Rhyl, Flintshire in 1889. The 1901 Census shows that the family lived at ‘Bonlondeb’, Brighton Road, Rhyl, Flintshire. The head of the family was Samuel Thomas Jones aged 47, who was a Calvinistic Methodist Minister. His wife Mary Jones aged 40 and their 8 (eight) children – William H Jones aged 16, Mary Jones aged 15, Thomas Elwyn Jones aged 11, Hannah E Jones aged 7, Helena E Jones aged 6, Annie G Jones aged 4, Alun T Jones aged 3 and Samuel G Jones aged 6 months. Also living with the family was Phoebe Ann Hughes aged 14, who was employed as a General Domestic Servant. On leaving school Thomas was accepted into Bangor University where he obtained a First Class Degree in Mathematics. He was a keen sportsman and Captained the Cricket, Football and Tennis Teams. In 1912 he was appointed Senior Mathematics Master at Carmarthen Grammar School and stayed in this post until July 1914, when he moved to Greenwich to study at the Royal Naval College. A Carmarthen schoolboy, Sidney Philip Perkins was sitting in his classroom at Carmarthen Grammar School, waiting for his mathematics teacher to arrive. He was surprised to see him enter the room in a full Royal Navy Officer’s uniform. The teacher, Thomas Elwyn Jones told the assembled schoolchildren: I have come to say goodbye, I am joining HMS Defence as a Mathematics Instructor. If you hear of a naval action in the North Sea, the Defence will be there. 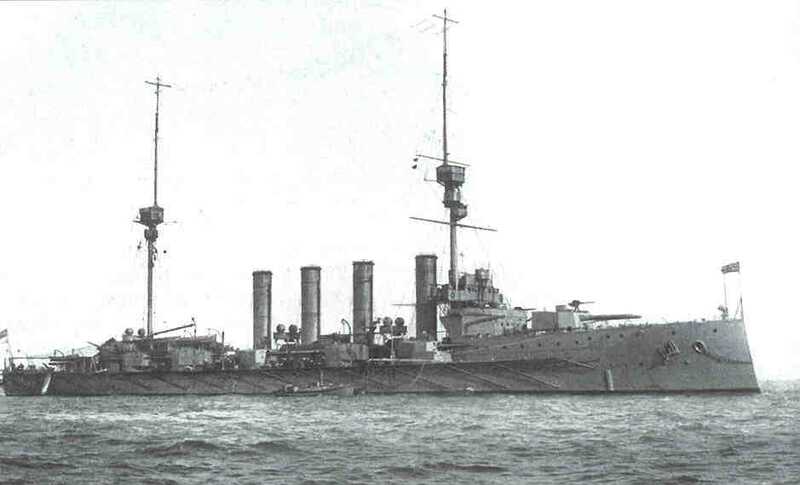 Thomas was joining the ill fated Minataur Class Armoured Cruiser, HMS Defence, blown up in the Battle of Jutland on 31 May 1916. As Perkins later wrote in his memoirs ‘Famous Last Words’. On Sunday 31 December 1916, Thomas joined the crew of HMS Defence one of his duties being to teach Mathematics and Physics to the Ship’s Midshipmen. The Battle of Jutland was a naval battle fought by the British Royal Navy’s Grand Fleet under Admiral Sir John Jellicoe against the Imperial German Navy’s High Seas Fleet under Vice-Admiral Reinhard Scheer. It was fought from 31 May 1916 to 1 June 1916, in the North Sea near the coast of Denmark. HMS Defence was sunk on Wednesday 31 May 1916. The ship’s magazine was detonated by fire from a German Battle cruiser. The fire from the explosion spread to the ship’s secondary magazine, which also exploded. There were no survivors and 903 men were killed. 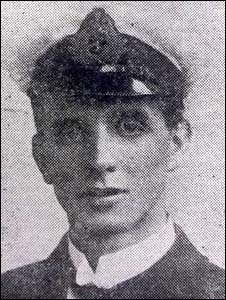 Two other Royal Navy sailors whose names appear on the Rhyl War Memorial were also killed during the Battle of Jutland – Lieutenant Alfred Bakewell who was killed in action when HMS Onslaught was severely damaged by enemy shells on 31 May 1916 and Signal Boy Peter James Thomas aged 16, who was also killed in action when HMS Invincible was sunk on 31 May 1916. Thomas is also remembered on The Plymouth Naval Memorial, on a Remembrance Plaque at The Royal Alexandra Hospital, Marine Drive, Rhyl, Flintshire and on The North Wales Heroes Memorial Arch, Deiniol Road, Bangor, North Wales.